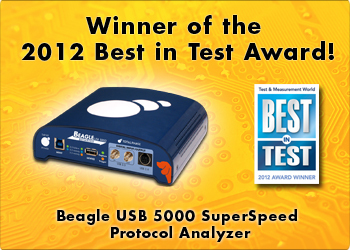 Beagle USB 5000 Analyzer Wins Best in Test Award! The editors and readers of Test & Measurement World Magazine have selected Total Phase's Beagle USB 5000 SuperSpeed Protocol Analyzer as Best in Test 2012 winner in the "Bus & Logic Analyzer" category. The awards were announced at a ceremony held in conjunction with DesignCon 2012. "We are absolutely thrilled that the Beagle USB 5000 analyzer has been recognized by the industry," said Derek Fung, VP Business, Total Phase. "USB 3.0 is on the cusp of mass adoption, and our Beagle analyzers' real-time, interactive capabilities will enable developers to more quickly and efficiently get their products to market." Renesas Design Contest - Enter Now! We are sponsoring a new design contest -- the Renesas RL78 Green Energy Challenge. Hosted by Renesas Electronics America, in partnership with Circuit Cellar and Elektor magazines, the Renesas RL78 Green Energy Challenge allows embedded engineers to showcase their green energy skills. This special challenge contest is open through August 31, 2012. Winners will be announced at the Renesas DevCon in October 2012 in Anaheim, CA. 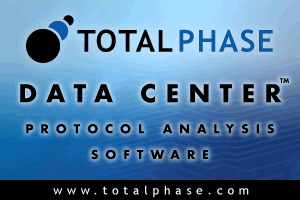 Total Phase is excited to announce our new partnership with the Atmel University Program! The Atmel University Program supports the advancement of eduction through technology platforms and engineering resources provided by Atmel and their university partners, including Total Phase. We are thrilled to support the academic community through this partnership and hope to venture into more educational opportunities in the near future! For more information about our partnership with Atmel, check out our Atmel university page. The Beagle USB 12 Protocol Analyzer is an excellent time saving tool that was affordable and easy to use. My product has seen increased sales growth and practically non-existent customer complaints after fixing my USB issues with the Beagle USB 12 analyzer.